It seemed innocent enough. A woman knocked on my door while my friend and I were working on crafts and watching the latest episode of Downton Abbey (which, by the way, did you know entirety of Season 4 on DVD already?!). 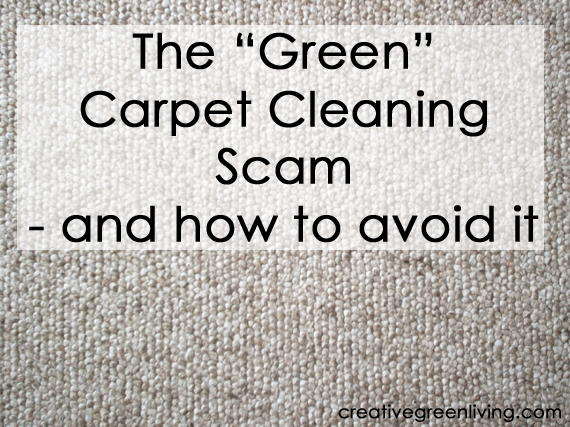 When I answered, a woman told me that she worked for a carpet cleaning company that was new to the area and to get the word out about their business, they were giving away 50 free carpet cleanings for one room in your home for free. She said there was no obligation but they hoped if you liked what they did that you would consider having them back to clean additional carpets OR tell your friends about them. My first concern was about chemicals. I don't let just anybody clean in my home. There are a lot of companies that call themselves "green" that are a far cry from being something I'd willingly allow in my home. When I asked about what they used to clean the carpets, she said it was a non-toxic cleaner but if I was still concerned, she could send them over and they could first do dry dirt extraction while I read the label on the bottle of what they use to dry shampoo and could decide then if it was okay or not. It seemed like a good deal so I said yes. She took my name and said she'd send someone over within the hour - as soon as they were done with my neighbor's house. About 45 minutes later, there was a knock on my door. I was greeted by an enthusiastic man who introduced himself as Kent. He said he was "just the box carrier" but that Alexi, a young man with long, curly hair and who appeared to be no older than 19 would be taking care of me. I said that was fine. Kent dropped off the boxes and left me alone with Alexi and the boxes. I started moving furniture out of the way so that the carpets could get cleaned in the living room which is the only room in our downstairs area with carpet. The first big warning sign that I was not getting what I was offered was when Alexi told me he needed to "set up his display first." I wasn't terribly concerned about it but was a little curious since the woman who had come to our door had said they weren't trying to sell anything, just to generate positive word of mouth. While Alexi was setting up, I told him I wanted to see the label for his carpet shampoo. Alexi seemed hesitant. He re-iterated that it was non-toxic, aloe based and that you could drink a whole bottle or pour it in your eyes and have nothing happen to you. I insisted I still needed to see it and he obliged. I wish now that I had taken a photo of the ingredients list but while it was not very long, there was nothing about Aloe on it. It also had the red flag ingredient "Fragrance" listed. A note about "fragrance": While all scented products are not inherently evil, "fragrance" can be listed on a product in order represent any blend of proprietary chemicals that make the product have a certain odor. These chemicals can include parabens and phthalates and other chemicals that are connected to allergic responses and hormone disruption in humans. Many of these substances do not have to be tested and verified to be safe before being added to the products. Whenever you find a product that lists "fragrance" on the ingredients RUN AWAY unless the bottle is also labeled as being paraben and phthalate free. Also, if you look at the Material Safety Data Sheet for the cleaner (see it here), it is clearly NOT non-toxic. While I was trying to research the product on my phone, Alexi told me he needed me to pay attention to him and he started talking. He was clearly new to this job, was unorganized and unsure of what to say. He was reading to me out of his packet about his 10 steps for sales. He started talking to me about his vacuum - a Kirby - which he said cost $3,500. At this point, I have clearly been roped into a product sales pitch. He starts going over all the features and fancy things about why this vacuum is the best thing ever. After about 5 minutes of listening politely I told him I really needed him to speed this up. The booking girl had said the whole thing would only take about an hour and honestly, my friend and I were planning to watch Downton Abbey while the carpets were cleaned. He'd already been there for about 20 minutes and hadn't even started cleaning. Finally, about 30 minutes after arriving, he started vacuuming my carpet with filters in place of the bag on his demo vacuum so that he could show me how much dirt his vacuum could pull out of my carpet that mine had left behind. Every pass or two, he had to stop to change the filter and this, of course, took forever. While he was doing this, I was whispering to my friend about how in the world I got sucked into the worst sales demo ever. I also started texting my husband to tell him what was going on. My husband said he had a co-worker once who had been a Kirby salesman and that part of their approach to sales is that they will not leave until you make them. I'm a generally non-confrontational person so I wasn't terribly excited about the prospect of having to kick this kid out of my house but decided to at least let him finish vacuuming the living room before I asked him to leave. I had to ask him to leave - Three times! As Alexi finished the last pass around my living room, I let him know that he had been there for more than an hour at this point, I really didn't have anymore time to give him and it would be great if he could wrap up and go. Of course, he said he had to call his manager first. After calling his manager, he asked me about the carpet shampoo. I told him I was concerned about several potentially toxic ingredients and didn't want him to use it. Then he wanted to argue with me about it. He again insisted it was a non-toxic 100 year old recipe that you could drink and pour in your eyes and be fine. The sassy part of me wanted to challenge him to drink some and pour it in his eyes, my friend interrupted us and told him that I was not really someone he wanted to argue with about toxic chemicals and he should just drop it. Of course, he didn't. Then my three year old: dressed in a fedora and super hero cape stepped in between us and said he wanted us to stop arguing. When Alexi went to keep speaking, he put his hands on his hip and looked at him and said "stop talking!". To which, of course, my friend and I could not contain our giggles. Alexi, however, looked at me and told me I had a rude little kid (which is ironic coming from a man refusing to leave my home and who wants to argue with me about chemicals in his cleaners). I told him he'd been there too long already and he really needed to pack up to leave. He said he really needed his manager to come by and see that he'd been doing work (by his demo filters he'd been stacking up on my ottoman) and can he just keep vacuuming until his manager gets back to him. I said fine, but he could have only 5 more minutes. After three and a half minutes, Alexi had not shown any signs of getting ready to leave and I interrupted him to tell him he had 1 and a half minutes left to finish getting his things put together and leave. If his manager needed to see his filters, to take a picture with his phone before I threw them away. At this point, Alexi finally started packing up. So 90 minutes after I let this kid into my home, he was finally gone. He was clearly no where near done with his pitch - and I think my husband was right that he wouldn't have stopped if I hadn't made him leave. And my carpet was only partially cleaned - how much longer would he have been there if we'd let him use his toxic carpet shampoo!? 1) If anyone shows up in your home with a brochure that looks like this: do not let them in. 2) Ask anyone who wants to clean your carpets if they do sales for Kirby. If they say yes, do not let them in. 3) Always thoroughly research any chemicals anyone wants to use in your home. This goes for legit cleaning companies as well - not just scammy ones like Kirby. EWG is a great place to start. I hope this story can be a warning to people. Especially people in the Portland, Oregon metro area where I live - these people are on the prowl. After I mentioned something about the experience on my personal Facebook page, the thread blew up with people sharing their similar horrifying experiences with Kirby sales people. Kirby may make an impressive vacuum cleaner but with predatory sales practices like these, you can bet I will never support this company. Our blog newsletter offers the convenience of email delivery but only goes out every 10-14 days. Please note: This is not a sponsored post. The post above is my first hand account of my experience with Kirby and Platinum Elite Distribution. Creative Green Living is in no way affiliated with Kirby or Platinum Elite Distribution. The woman who came to my door said they hoped I would like them and share about them with others. I certainly do not like them but I am delighted to share about them with others - and warn you to stay as far away from this company as possible! Thank you for posting this. I had a similar experience and reading yours has made me even more angry. Especially the part about not leaving until they call their manager and offer 6 other deals and say, "my manager just needs me to show you this one last thing." No, it's not one last thing, and they really don't leave. Plus, the person dropped them off so they have no car to go to the next place. I will NOT be so nice next time. You know, that's interesting. I hadn't thought about the dropping them off without a car as being part of the strategy. After I told him he had 1.5 minutes to get out of my house, he asked if he could at least wait on the porch since it was raining. We never even really got around to making me offers on the vacuum. He asked as he was leaving if I would buy it if it was affordable and I said I would buy it if it were $200 or less. That shut him down pretty well since there's no way he was going to be able to give me that much of a deal on it. Throughout the demo he had to keep stopping to call and check in with his boss, that was annoying. After the small section of carpet cleaning, his team lead came back and when we got back to the room asked if I was ready to "join the Kirby Family" - He hadn't even explained that he was trying to sell me this machine yet (not that I didn't figure that part out by then). He tells him how he hadn't mentioned the prices yet. So he starts with a price around $3500 if I remember correctly... then the more I said no the better and better the deal got. So he offers me no down payment, $153 a month, and $200 off the price for my old vacuum. He (the team lead) calls their boss and then they change it to needing a $150 down payment and I HAVE to sign up for automatic ACH payments because my credit isn't great. Fine, I actually prefer automatic payments and they said they would take a post dated check for the down payment. They made it seem like it was a done deal... then he says he has to call finance companies. Um, ok. So first two said no. The third one had just closed (it was 10pm by then). He calls his boss and when they are done talking the lead tells me that his boss has a friend that used to be the top distributor in the country and this guy just bought a finance company and how his boss was gonna get his friend to buy it and then I guess this friend's finance company would finance it to me? I am still confused. They took my check and credit application. I was supposed to get a text from the guy by now letting me know what time he would be by with the vacuum, but I haven't heard from him. I actually called Platinum Elite Distributors on my lunch break and told them to cancel my order. I asked if the guy could drop off my check or if I could pick it up, the lady said she would have to get back to me. I asked when to expect her call, she said to give her 20 minutes... That was almost 4 hours ago. I will never fall for this crap again! I sure do wish I had seen this before last night. I got suckered in to this demo and they were there for at least THREE HOURS. I had just gotten home from grocery shopping, which I had done immediately after work... I asked if I could schedule another time and they said they were only in my area that day. He said he would clean 1 entire room's carpet for free and that they were new to the area and were just trying to spread the word about their business and hoped I would tell my friends about them. I asked the guy "it this one of those things where you try to sell me a Kirby vacuum at the end?" - He tells me no, that they are just trying to get feedback about how they are doing.... Well my spare (empty) bedroom really needed the carpet cleaned... He said they would do the entire room. Seemed like a good deal even if they tried to sell me something, which he assured me they weren't. He set up all of his equipment in the corner of the room, he never called it his "display" but I thought it was odd to put it all there if he planned to clean the entire room. After taking quite a while to set up, he finally starts the vacuuming. By now I know this in fact IS the Kirby sales demo I suspected it was in the beginning before I let him in. He vacuums a second or two at a time with these small circle pads in place of a bag and keeps showing me how much dirt my vacuum left behind. It kicked up so much dirt in the air that I am still coughing almost a full day later. He left these dirty pads all over the floor even though I had pets walking around the house and even one stepped through the pad minefield a few times... Like I want all that dirt back in the carpet or on the pets?! I have 2 cats and 2 dogs, I had the dogs confined to my bedroom with a baby gate. I didn't secure it well enough so they knocked it down. Once they were out and the bedroom was no longer blocked, he took that opportunity to show me how much dirt was in my mattress. He didn't explain what he was doing, he just grabbed his equipment, made me carry some for him, went to my room, told me to plug the vacuum in for him (didn't ask, TOLD me to) - While I did that he ripped all the fresh bedding I had JUST put on my bed off and started vacuuming the featherbed topper I had under the sheets. After one pass and him making me watch a video about dust mites I told him not to do any more, I was grossed out and didn't want to see any more. He did more anyway and kept saying how he could do the entire thing as if he was doing me a favor. He left the bedding in a heap on the bed and the pads from the mattress part of the demo on the floor. Back to the spare bedroom, he did vacuum most of that... but not all. When he got to the shampooing part, he did like a 2-3 foot area that was only as wide as the machine. That was it. How is that cleaning an entire room?! He told me how the shampoo was completely safe and I could drink it or pour it in my eyes and how the pets could eat it and it would be fine.